This recipe of eggplant is so simple that I don’t understand why I hadn’t prepared it yet. It is easy and needs few ingredients. It is also perfect for a Summertime dinner outside and can be prepared in advance (I love recipes that can be prepared calmly in advance). You only need 4 ingredients, if you consider fresh basil leaves an ingredient. As repeated infinitely in this blog, the quality of the ingredients are mandatory. It shouldn’t be difficult to find good quality eggplants and tomatoes are we are in their plain season. The buffalo mozzarella has to be authentic – I didn’t try with another kind of cheese, but I believe it is a critical ingredient that makes the difference. 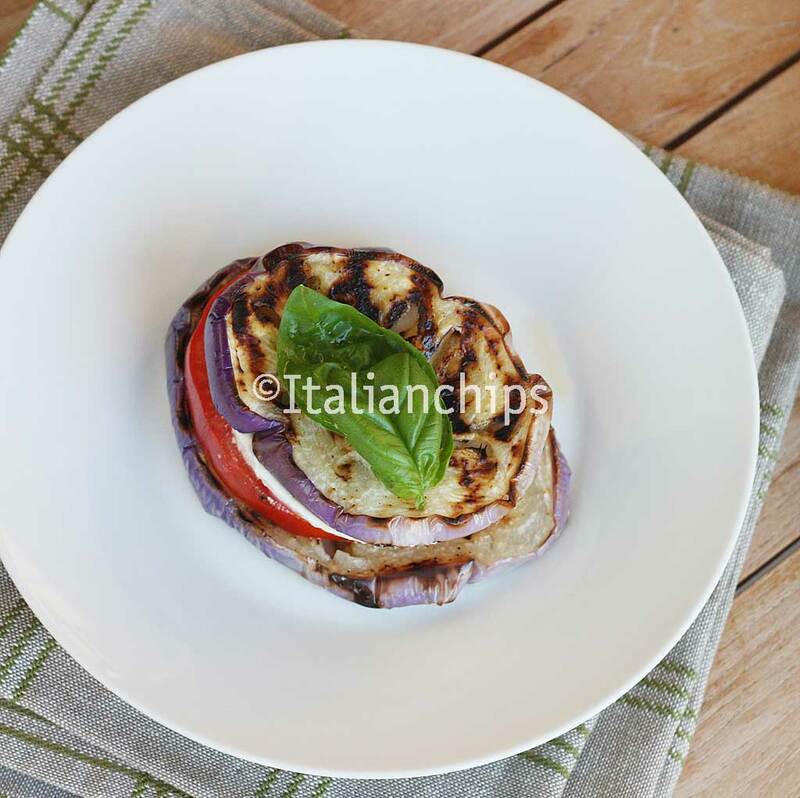 To prepare this recipe of eggplant, you just have to cut the light purple eggplants in thick slices, sprinkle salt and leave them on a colander for half an hour to lose their water. Cut the mozzarella in thick slices too and place them in another colander to eliminatepart of their milk. Take each slice of eggplant and using a kitchen brush, spread a mixture of extra virgin olive oil, salt and pepper. Warm a griddle and cook them, taking care of turning them upside down often, until well done. 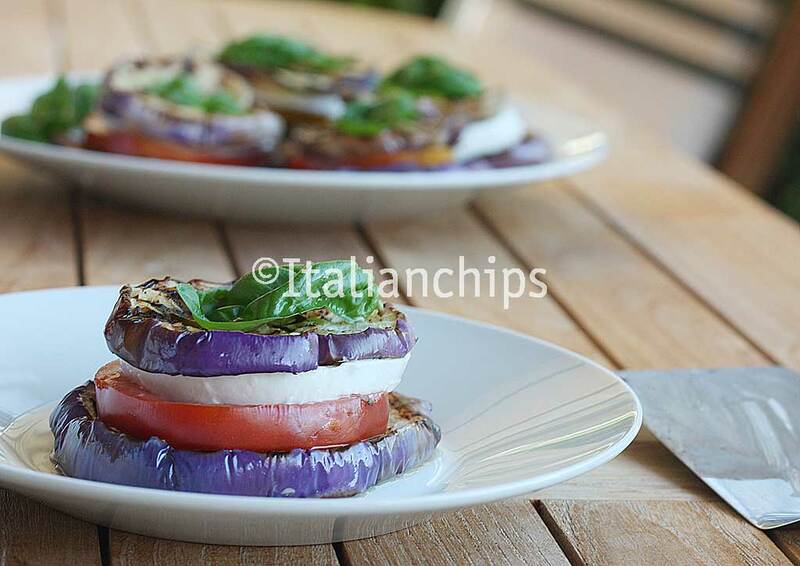 Before taking them to the table, just put a slice of eggplant, one of tomato, one of buffalo mozzarella and finish with eggplant. Add some fresh basil leaves to decorate and give aroma. That’s all! I loved it and have prepared it twice in two days ;-). Wash the eggplants and eliminate the top and bottom, cutting each in 4 thick slices. Sprinkle some salt on them and put them on a colander to lose the bitter water. Wash the tomato, eliminate the top and bottom and cut it in 4 thick slices. Put them on a colander to lose part of their water. Take the mozzarella and cut the extremities too (using in another recipe) and divide it in 4 thick slices. and place them into another colander to lose part of their milk. Mix some extra virgin olive oil with salt and pepper and spread on each eggplant slice. Warm a griddle and cook the eggplant slices, taking care of turning them upside down often until done. 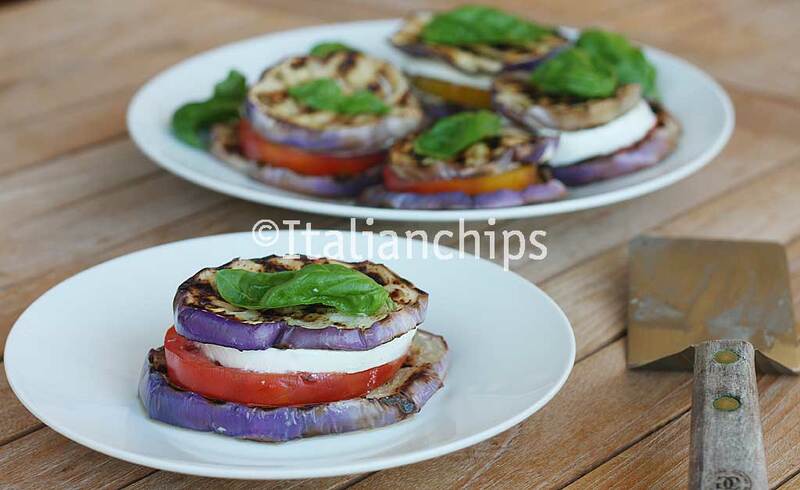 Right before serving, place a slice of eggplant, one of buffalo mozzarella and one of tomato, finishing with eggplant again. Add some fresh basil leaves to give some aroma. Fantastic pizza crust recipe with low carbs! A Greek cheese tart you will not resist, I swear!